Charli had his first groomer 'trim' - we didn't go for the full trim as it's quite a bit for a puppy to take. He looks like a mini Rumour (his Dad). Have a great day - that 's my thought for the day! What an absolutely great take on a traditional wedding card! I really liked the Subway Art and how you used it. I thought it was a great idea to have some of the images colored in, which makes it even more visually stunning. I also liked how you combined Subway Art with those elegant elements of the skeleton leaf and gold button. The whole card is extremely unique and eye-catching. And speaking of eye-catching, your dog is too adorable for words! So fun to read about Charli's first trim! 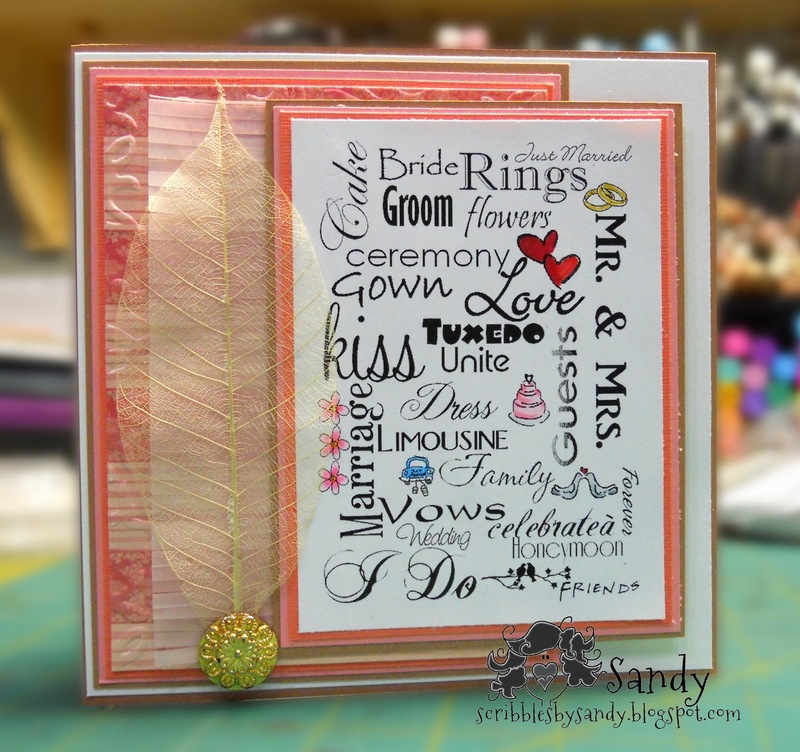 Thanks for sharing your talents with us here at the Simon Says Stamp Monday Challenge Blog! Lovely card and so different!! Great creativity!! Thanks for joining Through the Purple Haze Challenge. its a beautiful card Sandy. great wedding card!! I like that stamp! Thanks for joining us at Through The Purple Haze this week. This is a beautiful card. Thank you for sharing at CFTH challenge. Good Luck. Lovely card! Thank you for joining our "Anything Goes" Challenge at Love to Create this week. Hi Sandy a great card. Thank you for joining our challenge this week at Artistic Inspirations.